For 2017-18 notifications has been issued by the Delhi Education department inviting online applications from the candidates for filling up the posts of Guest teachers for Nursery divisions in various schools. Under the new notifications, candidates are welcomed to apply for the post of a teacher using the online application forms. Candidates who are interested are free to make their request for the job positions via official website edudel.nic.in. The new recommendation has been invited by the States Education department of Delhi government for the academic year 2017 – 18. The entire procedure for appointing teachers will be under taken by the DOE officials on daily basis under ad-hoc method. The procedure of hiring will continue till the teachers have been appointed on permanent basis. In order to apply for the above mentioned posts on the official website the candidates will only be allowed to log in using the Google Chrome web browser. The system does not support any other web browser as per norms stated. To get started with the application process candidates will have to first log on to the official website. From the home page of the website, you have to make the selection of “Recruitment or RRs” option. Once selected you shall be redirected towards second web page where you will have to make the selection of “Nursery Guest (Recruitment) and Engagement” for the year 2017-18. Now candidates will have to click the “Application Form” option for Guest teacher for nursery division for current academic year 2017-18. You shall be redirected towards the application form for filling in your details. Each of the applicant is expected to provide with more precise detailed information related to personal information along with their complete qualification details. Once all details have been filled in you can check with it for verification under preview option. When previewing it is advisable to check with each set of information updated for authentication. Once verified candidates can now submit the application form. You can also request for a printout copy of the application form. All candidates can also visit the nearest Government schools within the Capital city to apply for the teachers post for nursery level as guest teachers. 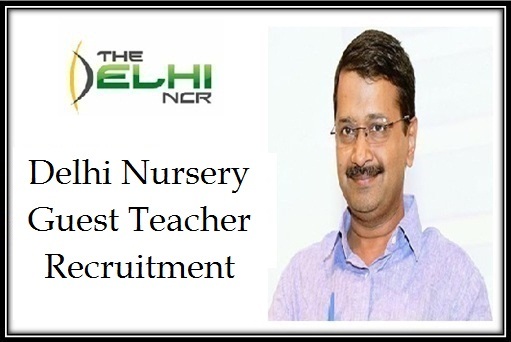 To apply as the Guest teacher for Nursery level in Delhi government schools, the candidate should have completed and passed a minimum of secondary school (12th Grade) from reputed school board. It is also important that the candidate should have secured a minimum of 45 percent marks in the Board exam. The candidate who has completed a certification course or a Diploma from recognized institute or under gone a complete training program as a teacher under B-Ed. Program as nursery teacher for 2 years is also eligible to apply for the job position. To be a full fledged teacher the candidate should have also secured minimum of passing marks in the desired subject in his 10th grade board exam. Check Merit List Click here. As per the recommendations stated each of the selected candidate under the scheme will be offered with job placements in various Government owned schools within Nursery section as Guest teacher. Once the candidate has been selected he or she will be offered with an incentive equivalent to Rs 1000 as salary on daily basis by the Government. The candidates who are interested are expected to apply for the job position via official website. The government has also stated that each candidate who will be selected under this scheme will be offered with paid salary as decided till they are offered with permanent job position. As the new recommendations have been made by the central government so it is obvious that once the selected candidates are appointed as permanent teachers they will be able to withdraw all other benefits including allowances, salaries, leave benefits and other benefits that are provided to permanent teachers by the government. Padnay walay jyada hai par nokri nahi.